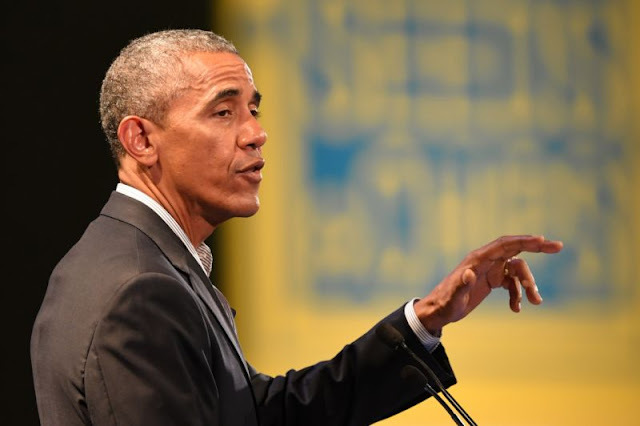 Former US president Barack Obama, pictured in this file photo from May 9, will deliver a paid speech on health care at a Wall Street event next week. New York - Barack Obama has begun cashing in on his time in the White House with paid Wall Street speeches less than a year after leaving office, a practice which drew stinging rebukes for Hillary Clinton during last year's presidential campaign. The former US president will appear Monday before a who's who of the US health care industry at a conference to be held next week by the New York trading firm Cantor Fitzgerald, according to two sources with knowledge of the matter. He will deliver remarks before answering questions from the audience, they said on condition of anonymity. Obama will discuss his signature 2010 health care reform legislation, known as Obamacare, which Republican lawmakers are still working to dismantle after several failed attempts. According to a person briefed on Obama's planned appearance, he will be paid about $400,000. In August, Obama addressed a New York gathering held by the Chicago private banking and wealth management firm Northern Trust. Panelists at that event, according to the firm's website, included billionaire former New York mayor Michael Bloomberg, chief Microsoft cybersecurity advisor Jonathan Trull and IBM general manager for "blockchain" technology Marie Wieck. Obama received $400,000 for his Northern Trust appearance, according to Bloomberg News, which also reported Monday that the former president had made a similar appearance this month at the private equity behemoth Carlyle Group. Carlye Group and Northern Trust both declined to comment when contacted by AFP. A spokeswoman for Cantor Fitzgerald confirmed that Obama would attend next week's event but offered no additional details. The speeches are the first Obama has given to Wall Street since leaving the Oval Office on January 20. Since May, Obama has made paid appearances in Italy, Germany, Scotland, Canada, Indonesia and South Korea. He is also due to make an appearance later this month in Toronto and to appear at a New York synagogue in January. "Since leaving office, President Obama has spent his time doing public and private events, both paid and unpaid, that are true to his values and his record," Kevin Lewis, an Obama spokesman, told AFP. "Consistent with that, his paid speeches in part have allowed president Obama to contribute $2 million to Chicago programs offering job training and employment opportunities to low-income youth." The appearances nevertheless risk drawing the same criticism that bedevilled Clinton during last year's White House campaign, exposing Obama to barbs from the left of the Democratic Party, which currently has no clear standard bearer. Clinton has since written she now regrets delivering paid remarks to the investment bank Goldman Sachs and others because it created the impression that she was in their pockets. Since her defeat, Senators Bernie Sanders and Elizabeth Warren, who are fiercely critical of the financial industry, have taken on more prominent roles in the party. "Given that (Obama) is probably not going to run for office again, being paid to give speeches by Wall Street firms will not compromise any policy decisions now or in the future," said Randy Albelda, an economist at the University of Massachusetts Boston. "Still, these type of appearances (and being paid well for them) may tarnish his reputation among a liberal base and bolster the perception that Democrats are the party of the elite." Wall Street has viewed Obama with some caution. As president, he denounced the financial industry's "reckless practices" while pushing for stricter government oversight. Still, the Obama administration failed to prosecute a single senior Wall Street banker after the 2008 financial crisis and did not dismantle any of the banks deemed "too big to fail." Obama is also hardly the first former leader to work the paid speech circuit. Former British premier Tony Blair and former US president Bill Clinton have done so famously. And in 2013, former French president Nicolas Sarkozy appeared at the annual SkyBridge Alternatives (SALT) conference in Las Vegas, an event spearheaded by President Donald Trump's one-time communications director Anthony Scaramucci. Barack Obama has begun cashing in on his time in the White House with paid Wall Street speeches less than a year after leaving office, a practice which drew stinging rebukes for Hillary Clinton during last year's presidential campaign.